Background: The benzofused six membered ring lactams is the part of the core structure of various pharmaceuticals, natural products, agrochemicals and active components of various dyes. The failure to control the microbial infections and the rise in the rate of resistant to antimicrobial agents, there is a strong need to develop new antimicrobial agents. In the current study, we synthesized some benzofused six membered ring lactams as a trial to obtain valuable precursors for the discovery of future antimicrobial drugs. Method: Syntheses of benzofused six membered ring lactams (4a-c and 5a-c) were reported via Beckmann rearrangement on indanones oximes as well as on indanones oxime tosylate. Structures of all products were well characterized by the rigorous analysis of their IR, 1H NMR, MS and elemental analysis. The in vitro antimicrobial activities of all the synthesized compounds 4 and 5 were determined against Gram-positive, Gram-negative bacteria and the fungal species Candida albicans using broth macrodilution method. Results: The Beckmann rearrangement of 3-substituted indanone oximes and indanone oxime tosylate were studied and thionyl chloride in case of indanone oximes as well as AlCl3 with oxime tosylate were identified the best catalyst. Bacterial growth inhibition was observed with bicyclic lactams although their MIC values were higher than ampicillin. The significant inhibitory effects were shown by majority of compounds with MIC values 125-250 µg/ml. Antifungal activity of bicyclic lactam derivatives was observed against C. albicans. However, MICs values of all tested compounds were higher compared to standard antifungal agent miconazole. Conclusion: After screening many Beckmann conditions, thionyl chloride condition in case of indanone oximes was found the best Beckmann condition whereas with oxime tosylate, AlCl3 was found the excellent catalyst. All synthesized benzofused six membered ring lactams were screened against Grampositive, Gram-negative bacteria and the fungal species Candida albicans using broth macrodilution method and concluded that new bicyclic lactams seem to be valuable precursors for the discovery of future antimicrobial drugs. Keywords: Beckmann rearrangement, indanones, dihydroquinolinones, dihydroisoquinolinones, bicyclic lactams, antimicrobial activity. Keywords:Beckmann rearrangement, indanones, dihydroquinolinones, dihydroisoquinolinones, bicyclic lactams, antimicrobial activity. Abstract:Background: The benzofused six membered ring lactams is the part of the core structure of various pharmaceuticals, natural products, agrochemicals and active components of various dyes. The failure to control the microbial infections and the rise in the rate of resistant to antimicrobial agents, there is a strong need to develop new antimicrobial agents. 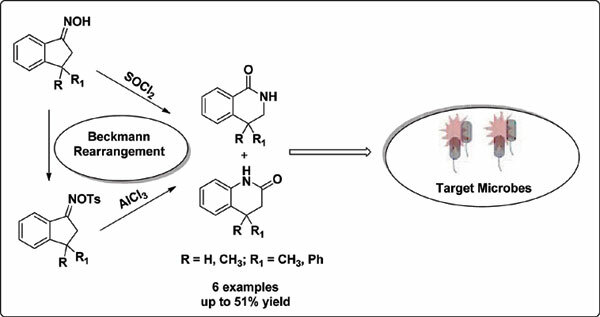 In the current study, we synthesized some benzofused six membered ring lactams as a trial to obtain valuable precursors for the discovery of future antimicrobial drugs.